The Twins and Tigers finish the three-game series at Target Field with first pitch at 12:10 today. Kyle Gibson (1-2, 3.96 ERA) pitching for the Twins against Michael Fulmer (1-3, 4.35). Joe Mauer was on the exercise bike on Tuesday as he tries to recover from his whiplash/concussion-like injury. Miguel Sano will play first base for Class AAA Rochester today in his rehab stint. Interesting, as it will give the Twins some options when he returns to the big club. Also, Michael Pineda threw off the mound for the first time since his Tommy John surgery last July. The veteran righthander might be able to play for the Twins before the season ends .. 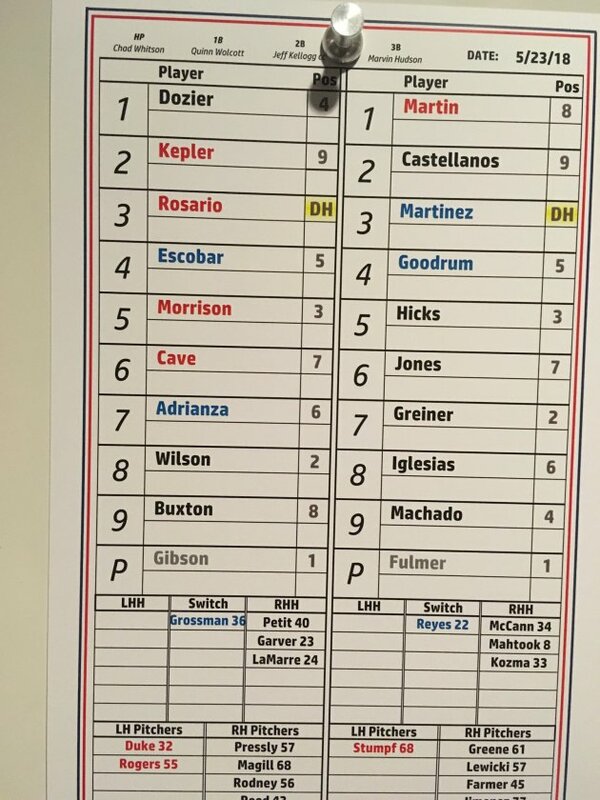 Here are the lineups, with Jake Cave hitting seventh and playing left while Eddie Rosario is the DH for the Twins. Lance Lynn pitched the Twins to a 6-0 victory last night, and was mildly happy with his effort. Also, the Twins signed former NL home run leader Chris Carter in an interesting deal ... for a roster that is still in flux.